WE ARE SOLD OUT! 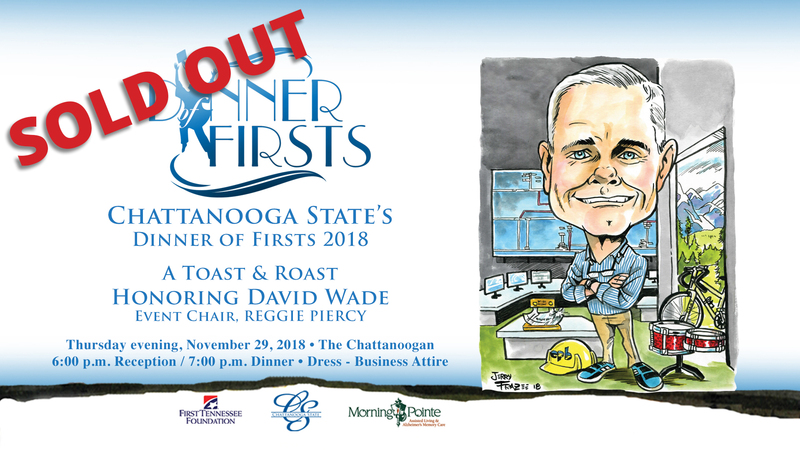 Chattanooga State Foundation’s Dinner of Firsts on November 29, 2018 is sold out. You still have an opportunity to honor David Wade and provide scholarships for first generation college students by making a gift online to the Tom Edd Wilson First in the Family Scholarship at give.chattanoogastate.edu. This seventh annual dinner event will honor local community leader David Wade with Reggie Piercy serving as Event Chair. In addition to being a first generation college student, David is a Chattanooga State graduate and the President & CEO of EPB of Chattanooga. Those roasting David include Todd Crawford, Joe Ferguson, Richard Rogers, Steve Rogers, Justin Wade, and Aaron Webb. Jed Mescon will once again serve as our Master of Ceremonies. We are honored to have Jeff Jackson, Market President of First Tennessee Bank along with Greg Vital, President and CEO of Independent Healthcare Properties & Morning Pointe, as our presenting sponsors and evening co-hosts. Proceeds from the event fund scholarships for first-generation students and are divided equally between the annual First in the Family Scholarship and the Tom Edd Wilson First in the Family Endowed Scholarship. Nearly half of our students that apply for financial aid are the first in their families to attend college. Earnings from the first six years have provided more than $340,000 in scholarship support for first-generation students. Questions? Please contact Tammy at (423)697-3359 or email tammy.sawyers@chattanoogastate.edu.